As with many repeating patterns, domestic violence has a cyclical nature that follows 3 stages. Knowing these stages is helpful to identify these abusive patterns in a relationship. 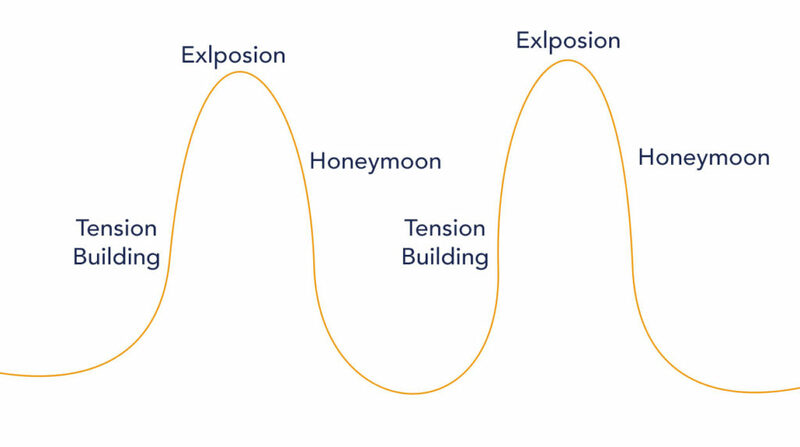 There are 3 stages that we will look at: tension building, explosion, and the honeymoon. In this phase of the domestic violence cycle, there is an ongoing tension that is building. There’s no specific timeframe. It can be a matter of days or a matter of months. During this time, stress starts to build both within the couple and outside the relationship. The abuser might be increasingly irritable, taking out stress on those around him. Often times the victim of abuse might try to alleviate that tension by appeasing or placating their partner. They try to suppress the tension. Hoping that if they can take away the stress, it will keep the tension from rising. This stage is marked by escalating levels of anger, criticism and even small outbursts. Often the whole household feels they are walking on eggshells hoping things won’t erupt. However, eventually they do. This phase is where the tension boils over and an instance of violence occurs. The attack can be physical, verbal, or sexual, and likely leaves everyone involved damaged and in pain. Particularly, if the cycle has been going on for a while the victim will often start to make statements vowing to not let this happen again and about the boundaries they will and should have already set. In this phase, the tension starts to deescalate. The abuser will apologize and vow to change, often making promises that it will be different going forward. They explain what they have learned from their mistakes and work reactively to heal the damage caused by their behavior. Apologies, gifts, and grand gestures are staples of this stage. These kind of actions may involve momentary sincerity or remorse, but are really meant to manipulate their partner into not following through on their boundaries and attempt to return things to normal. As with the tension building stage, this stage has no specific timeframe and can last a matter of days or a matter of months. The domestic violence cycle is characterized by reactiveness. Anger and irritability during the tension building stage are a reaction to the stress of life that the abuser is unable to effectively cope with. Their partner is reactive to the rising tension and thus will make attempts to mitigate the stress or placate their partner. After the explosion takes place the abuser reacts out of shame and guilt which launches them into the honeymoon stage due to their remorse. Identifying these patterns is an important step in recognizing the need for help. To break the cycles for good it’s important to get help and work to understand what is needed to keep patterns like this from repeating.